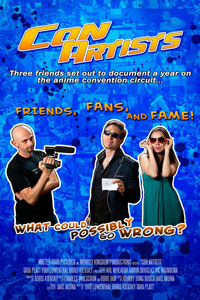 A docu-mocku about voice actors and celebs working the convention circuit. Directed by Boris Kievsky, written by Kievsky, Yuri Lowenthal and Tara Platt, and produced by Monkey Kingdom Productions, Matter Door, and Vaya Con Artists, Con Artists is coming in 2014. Featuring appearances by Aaron Douglas, Wil Wheaton, Vic Mignogna, Paul Jenkins, Keith Arem, Ashley Johnson, Maile Flanagan, Mary Elizabeth McGlynn, Steve Downes, Dee Bradley Baker and more, fans and curious alike are sure to enjoy the cons, with these con artists.